The Public Observatory offers 9 sets of high powered binoculars, an astronomical library, and 9 state-of-the-art medium-sized personal telescopes. 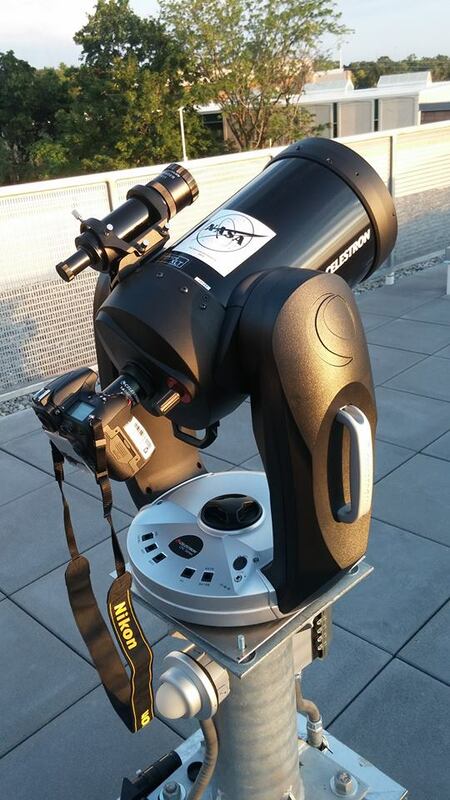 Its inventory also includes various sizes of eye pieces, solar filters, and laser pointers to guide in star hunting. It also is a science education facility used in WSU academic classes. The Public Observatory can be reserved by the public starting at $100 per hour, with a 1 hour minimum reservation. Please email planetarium@weber.edu for more information. The Ott Planetarium will be closed June 1, 2019, for stage one of renovations. We are scheduled to open again Fall semester 2019. Please check our website and facebook page often for updates and for Science Saturday Activities that will still be held this summer. Please contact the Weber State University Physics Department for any questions or concerns: (801) 626-6163. In case of inclement weather, we will be meeting at the Ott Planetarium room 203 in Lind Lecture Hall. Please see the CONTACT US page for location and directions. Star Party dates for Spring semester 2019 have been announed! Check back here for updates.